Country = France, month = August, day = Wednesday. Overnight hail and rain pounded our Longueil gite, not far from ticket outta Quiberville. Local paper's weather prediction is "maussade", outside my O-level vocab of soleil and pluie. Handy pocket dictionary obliges with sample phrase "Quel temps maussade!" -- what gloomy weather! Teriffique. Fortified with a pain au chocolat or three, off to Dieppe, "a cheery port". Voiture parked safely underground, we emerge on the front to be met with a mighty wind. 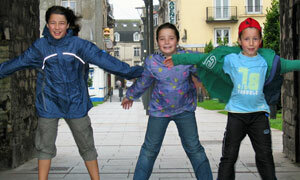 Kids enjoy leaning back into the gusts, raincoats flying. Spot a handful of brave souls in the outdoor part of a nice looking swimming pool, c/w water slide, rapids, the whole ten metres. Looks warm and inviting. Take shelter in La Coupole snack bar. Further nourished by frites and oeufs and citron crepes, clasping a tourist info leaflet, we head for the old fishing district over a bridge built by a chap named Eiffel. There's a "vent violent" and I vaguely fear that something, maybe The Boy's Monoprix-bought Playmobil quad bike, or someone, maybe The Boy himself, will get swept into the sea: walk abandoned. Head for safety of Auchan supermarche. Two days later, conditions un soupcon improved, back to scallopville with towels and swimwear to try out Les Bains, built 2007. Navigate state of the art PIN-protected lockers, all change, and into the water ... pardon, mon ami, not so fast. Who, moi? Oui, says lifeguard fella, not with those shorts. I point to the Speedo logo. Still non, dit-il. There's proper trunks available upstairs, he continues. I slink back to the desk in my shorts of shame. Waddya know, they have a vending machine dispensing maillots and goggles for those with the appropriate Euro moolah. I feed in some currency, and voila, my new "boxer homme moyenne". One final filigree of Frenchery to request change for the locker and, enfin, je suis dans l'eau.